Frustrated with the job market and wanting to help her husband, who had earned his MBA from Georgetown University, Robin decided to set up a website to creatively draw attention to his credentials. 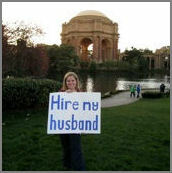 My Husband Needs a Job is perhaps one of the most creative websites I’ve ever seen for job hunting. I think this is a great way to proactively go after what you want (or what you want for your spouse)! And apparently Oprah agrees. The header images she uses on the website are personal and unique and really make the site stand out. 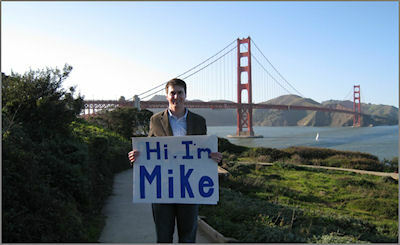 And everything a potential employer might want to know about Mike is readily and conveniently available on the site, including a spiffy contact page, his resume, and even a personal blog for providing updates on the job search as well as other musings that might just serve to allow those potential employers to get to know Mike. While the YouTube video accompanying the site doesn’t really stand out, it’s short and courteous to potential employers, unlike most job hunting gimmicks I’ve seen. And it’s real purpose is not to stand out on the video sharing site, but to introduce himself within the content found on the “Meet Mike” page anyway. I suspect gimmicks rarely work because someone looking for a new employee isn’t likely to sit through something tedious and then try to contact someone for the resume information that should have already been presented. Not sure what I mean? Well, compare Mike’s video to this video. Beyond helping him find a job, which I sincerely hope the website does, it’s also a pretty good way to enter the blogosphere at large. I can’t help but want to follow the plight of Mike and Robin in California.